Just over 2 years ago, Vacant Richmond popped up and mapped all of the properties listed on the city’s Vacant Building Registry (PDF). The city stopped updating their data and Vacant Richmond went off the air. We still have many vacant houses. Focus on the 1300 block of 27th Street. What can be done? How many property owners are involved on that block? Who are the stakeholders- including nearby residents, nonprofits, and government agencies? What are the block’s strong and weak points from a realtor’s point of view? How much money would it take to buy the whole block? What are some visions for it? @Scott – That block is within the boundaries of the Church Hill Central area of the city’s Neighborhoods in Bloom program. This offers worthwhile tax incentives to fix up properties in the area. The area will likely see some traction from Better Housing Coalition’s huge redevelopment at Beckstoffers and Habitat for Humanity’s nearby Pillars at Oakmont. Richmond Affordable Housing is Better Housing Coalition, that’s a good thing. Wow, that’s a nice looking brick one, 921 20th St. A lot of them look like renovations were started and maybe the money dried up. There’s also one that’s been vacant the whole time I’ve lived here — 2202 or 04 E. Broad. The owner keeps it up enough to not get complaints, but has never sold it or tried to sell it or fix it up for rental. I’ve never found out the story on it either. Great, brick house too. And people wonder about squat to own? The city has been extremely lenient with these property owners, which is no favor to the residents and business owners around them who have invested their own blood sweat and tears in the neighborhood. I’d be all for giving them one year to make it habitable, then condemning and repossessing the property to be sold at auction. Everyone bemoaned the loss of Union Hill, but not until long after it had fallen into such disrepair. Do I see history repeating itself? Jehovah #8, the only problem with your solution is that Virginia is a “property rights” state. Unless the owners have not paid their taxes, there isn’t much that can be done and the city can’t take the property. There would have to be some MAJOR law changes to make that sort of “taking” happen. I’m not saying I don’t agree with you, ’cause I actually DO agree – but it would mean going to the general assembly for permission to change the city charter. And I don’t think, in Virginia, that the municipality taking ownership of an unoccupied house would ever become a law, sorry. Oops, sorry Jehovah #8, forgot one thing – there is a provision in the Old & Historic districts enabling legislation that enables the municipality to take possession through a legit non-profit organization. It happened at 11 1/2 North 29th Street nearly 20 years ago, but it involves a seriously contributing structure (that one faced Libby Hill Park, and dripped wrought iron trim, had serious architectural features, etc.) in an O&H district being in serious danger of literally collapsing before anything can happen. Even then, as I recall, the city didn’t take title, the APVA took title for a brief while then auctioned the property thru an auction that included showing proof of being able to rehab the property in a certain amount of time. Add to that that most of these properties don’t look like they are either in an O&H, nor are they seriously contributing structures in same. Somewhat off the above topic but related to squatting – it used to be all the rage in London, and I seem to recall reading something recently about a similar group having taken over a mansion in London belonging to some old money family who had long moved out…apparently the process there of evicting the squatters is much more complicated than here. I actually admire out local squatters, think they’re drawing attention to something that needs attention. 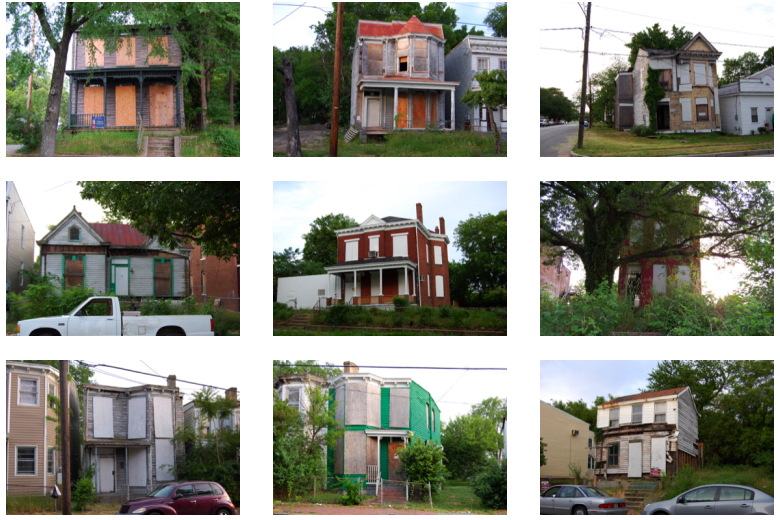 crd & Jehovah, your posts bring make good points regarding the dilemma of vacant structures, especially those in Federal and State historic districts like Union Hill. However, one thing Post #10 refers to is an idea that some homes are “more historic” or “more contributing” than others. From the National Park Service/Va Dept of Historic Resources perspective, once a district has been designated, and a structure is determined to be contributing or not, there is no other “value rating” for one structure versus another. The reason why Union Hill was designated a National Historic District is because of the quantity of pre-1900 structures still standing. It was the density and variety of structures that added to the district’s uniqueness and helped it qualify for designation. This means that a modest frame cottage on the 700 block of 24th Street is just as important as it’s grander brick neighbor, Cedar Street Baptist Church. Yes, the NPS nomination certainly has more ink on the church than the neighboring cottage, but their relationship was symbiotic. If it weren’t for all those modest cottages, the church never would have been built. So, to many of us living in Union Hill, the smaller homes, crafted with pride by the working class people who built them are just as important as the larger scale, more prominent buildings. It’s the village that got the designation, not an individual building. This also explains why Federal and State Tax Credits are equally available to an owner who renovates a cottage versus a larger/grander structure. I mention this because several of the homes in Murden’s slide show are in Union Hill, and they are definitely historic and were deemed contributing to the district. I wish they’d just get ACORN to run down the owners and get these places sold to appreciative new owners. ACORN does that kind of thing all the time, while this fine housing stock just rots. Very sad, and such a waste of our city’s fabric. #11 UnionHill RVA, thanks. I did not mean to make it sound as if some houses are considered more important than others; however, since the incident with 11 1/2 N. 29th, the city hasn’t deemed ANY house important enough to salvage the way they did that one. Instead, they’ve allowed demolition by neglect such as is going on with many of these structures that John has listed. I wasn’t aware that any of these were in the Union Hill district,so again thanks for pointing that out, too. The process for acquiring vacant/neglected properties is cumbersome, slow and expensive. Landlord lobbyists at the General Assembly like it that way. Second, DCD does not have much interest in this process, so does not devorte much attention to it. I had an idea a while back. Seems like a HUGE undertaking, but I think the city would benefit in so many ways. You take folks that are currently living in public housing and have them literally work with the city or a non-profit to rehab a house. They have to be very involved and actually get their hands dirty and do a lot of the work. Then, once the house is rehabed, it is offered to the individual(s) at an extremely discounted rate and is financed by the City. An old house gets a nice makeover, a motivated individual not only gets a nice house, but also gets marketable job skills. The neighborhood and the lives of those residing in it both improve. There are so many vacant non renovated houses because of people like Don Lacey, his attorney and network. They used these properties to steal money from people while never fixing them up. They were used over and over again to borrow money under many different LLCs. Some of these houses have over $300,000 in outstanding notes…….They also changed the assessments because they were based on sales prices, that were purposely hyperinflated for the scam. can I get a lisiting of your vacant properties. address, possible former resident etc?